The art of storytelling is a complex one, but most tales can be distilled into a simple theme: good versus evil. While this approach to narrative might not seem immediately problematic, it becomes much more obviously troubling when a group of systemically oppressed people is repeatedly cast in the role of the villain. The Jewish people in particular have suffered a lot at the hands of this discriminatory casting, as is achingly apparent in Geoffrey Chaucer’s “The Prioresses’s Tale.” The poem, laden with an exaggerated anti-Semitism, has been difficult to reconcile for many critics. 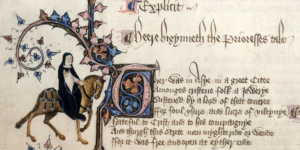 Some of Chaucer’s most devoted supporters excuse his prejudice as satire or as merely an unavoidable reflection of his historical and social context. I would argue, however, that these readings do not do enough to address the very real consequences of such anti-Semitism, spending too much time debating its origins rather than its effects. As Natalie Weber shows in her post “’The Prioress’ Tale:’ The Problem of Medieval Texts and the Alt-Right Movement,” Chaucer is speaking to people whose voices are still poisoning modern society. But his anti-Semitism may not even be the most famous in the world of media and entertainment. Another way we can consider “The Prioress’s Tale” and its impact on Western culture is by examining the problematic nature of Chaucer’s work alongside that of another figure who looms perhaps as large and faces similar accusations: Walt Disney. 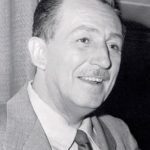 While many have debated whether or not Disney was sexist, racist and anti-Semitic, the lack of cultural sensitivity and the presence of moral oversimplification in his work have made indelible marks on popular culture, regardless of the personal feelings Disney had towards these groups of people. In her tale, the Prioress tells the story of a young boy who is murdered by inhabitants of a Jewish ghetto for singing the Alma redemptoris as he passes through their town. The depiction of Jewish people in this story is wholly unfavorable, to say the least, their cruelty a directive from Satan himself. The young boy, by contrast is the embodiment of religious devotion and childlike innocence. He exhibits a degree of obedience and desire to please God seldom found in seven-year-olds, no matter how pure of heart they may be. The Prioress introduces him primarily through his steadfast faith: “And eek also whereas he saugh thy’mage/Of Cristes mooder, he hadde in usage,/As hym was taught to knele adoun and seye/His Ave Marie as he goth by the weye” (Chaucer 505-508). This child devotes his whole being to the worship of Christ’s mother, kneeling whenever the occasion for it arises. Throughout the poem, the Prioress emphasizes how the child behaves as he was taught, never once suggesting that he would deviate, intentionally or otherwise, from behavior sanctioned by his mother, his teachers, or by God. He is constantly characterized as “innocent” and “litel,” making it impossible for anyone to find fault with a creature so pure. Another section following his cruel murder compares his perfection to emeralds and rubies: “This gemme of chastite, this emeraude/And eek of martirdom the ruby bright” (Chaucer 609-610). By conflating the child and his “chastite” and “martirdom” to perfect jewels, the speaker defines him and his conduct as ideal, as items that are synonymous with value. The speaker’s representation of the Jews is as condemning as the child’s is laudatory. The Prioress’s immediate connection of them to Satan could not make their evil nature any more clear. She says, “Oure firste foo, the serpent Sathanas,/That hath in Jues herte his waspes nest” (Chaucher 558-559). As if it were not enough to accuse the Jewish people of being under the influence of Satan, the speaker had to characterize that influence as a wasp’s nest, implying not just danger, but a sort of festering corruption. They are not even distinguished by any one character, but simply exist as one uniform body of “cursed Jues.” Through the Prioress, Chaucer develops a narrative of good versus evil devoid of any character complexity on either side. 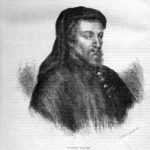 Whether or not one believes that the story is evidence that Chaucer himself was anti-Semitic, he still engages with this harmful collapsing and villainizing of the Jewish community, and as Emmy Zitter argues in her essay “Anti-Semitism in Chaucer’s Prioress’s Tale,” “a satirist can be only as effective as his audience’s attitudes will allow” (278). Try as scholars might to search for reasons to read the tale as ironic, much of Chaucer’s audience would have seen such a representation of Jews as affirming of their own negative perceptions, and that fact is what makes the text dangerous, regardless of Chaucer’s intent. While most of the Disney films that persist in the modern consciousness stop short of egregious anti-Semitism, problematic representations of certain ethnic groups are still perpetuated by the company. In an article from the Israeli newspaper, Haaretz, Rachel Shalita from the Education Department at Hamidrasha Art Academy discusses the ways in which more modern Disney films promote anti-Semitism. The article’s author, Dana Shweffi, writes, “Shalita claims Aladdin depicts Arabs in a way that is reminiscent of old anti-Semitic cartoons and caricatures. ‘The movie opens with an Arab character that looks like a caricature of a Jew with a long nose and all of the Arab characters speak English with an Arabic accent except for Aladdin and Princess Jasmine who speak with an English accent’” (Shweffi). Even though it was made in 1992, Aladdin seems to actively embrace ethnic stereotypes. Through these characterizations, the Walt Disney Company does no favors for the Arabic or Jewish people, but this simplicity of representation manifests elsewhere as well. This lack of nuance also bleeds into all Disney films’ approach to morality, a problem that is more subtle, but still has insidious effects. In films as old as The Three Little Pigs or as new as Aladdin, Disney’s staunch conservatism continues to make its way into much of his work. As with Chaucer and his “Prioress’s Tale,” “…much of the major animated work to come out of the Disney studio, the subtleties of traditional stories are boiled down into stark moral tales of Good v Evil, the forces of light against the forces of darkness” (Michel 10). These kinds of narratives may not be as obviously as harmful as those that deal in ethnic stereotypes to make their points; they are more subtly sinister in their role in dictating the moral values of an entire culture. Debating whether or not Disney or his work was intentionally anti-Semitic is in some ways a less productive discussion than one that examines “…Disney’s work as a potentially significant factor in shaping the notions of racial and cultural hierarchy in the West and the Third World alike” (Michel 13). The simplicity of the good versus evil narrative is necessarily morally reductive and quite often places a person or group of people, sometimes Jewish people, in the position of wrongdoer. To have children consume media of this kind during such a formative period encourages them to develop a moral framework that is not unlike the one Chaucer puts forth in the “Prioress’s Tale.” Sure, the story is more compelling for its extremeness of character, but these tales also instruct one to understand humanity and morality as a dichotomy, so that when ambiguous ethical questions do arise, impressionable audiences are less equipped to deal with them. Medoff, Rafael. “Streep Ignites Debate: Was Walt Disney Anti-Semitic?” The American Israelite, 2014. Michel, Claudine. “Re-Reading Disney: Not quite Snow White.” Discourse: Studies in the Cultural Politics of Education, vol. 17, no. 1, 1996, pp. 5-14, doi:10.1080/0159630960170101. Zitter, Emmy. “Anti-Semitism in Chaucer’s Prioress’s Tale.” The Chaucer Review, vol. 25, no. 4, 1991, pp. 277-84. Shweffi, Dana. “Do Disney Movies Promote Anti-Semitism and Racism?” Haaretz, Haaretz Daily Newspaper Ltd, 16 Aug. 2009, www.haaretz.com/1.5092056. I’m not going to try to talk you out of social media. 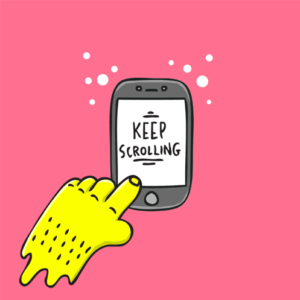 Sure, it might be a bad habit to spend fifteen minutes scrolling through Instagram before I get out of bed in the morning, and I don’t want to know how many hours of my life I’ve spent procrastinating on Facebook, but I’m no Luddite: this is the world we live in now. While I’ll never be one to condemn social media, I do think it’s important to realize that these social platforms, like all physical platforms, are stages. The versions of ourselves that we put forth online are heavily revised; we’re acting out parts and exaggerating the best features of our lives. 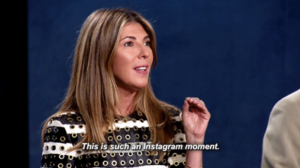 Especially with the characteristic immediacy of stories on a growing number of platforms, such as Snapchat, Instagram, and Facebook, it can be difficult to discern just how authentic these put-forth “realities” are. In our incessant need to capture all things glamorous, the selves that are featured online are caricatures at best. Though the stream of images, posts, and witty captions hold some validity, social media is also distortive through the control we have over what is spotlighted and what is left to the shadows. 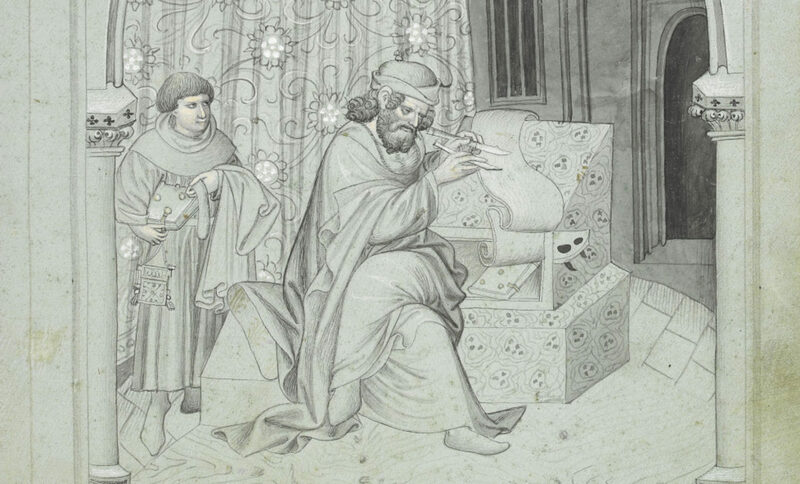 Yet, this obsession with self-presentation is not a new phenomenon, and such careful consideration of appearance is evident even in the Middle Ages. Chaucer’s Canterbury Tales illuminates this preoccupation with image and reputation. Though several members of the pilgrimage suffer because of their lack of genuineness in their professions, the Prioress attempts to mask her emphasis on image as she acts out the role she is expected to play in society. That is, a prioress should be a pious figure who inspires others to act virtuously. The other pilgrims expect the Prioress to be singularly devoted to religion, but as demonstrated by her description in the General Prologue, the Prioress has other wordly fixations. Similar to modern vanities, the Prioress is preoccupied with her appearance. She is described as being able to speak elegant French and as wearing extravagant beads and a brooch, giving her a rather noble and proper disposition rather than the humble servitude one might expect from her. Along with this desire to appear noble, is the Prioress’s love for food. She appears to pay no regard to her vows of poverty and indulges herself on luxurious feasts to demonstrate her understanding of table manners, letting “no morsel from hir lippes falle, ne wette hir fyngres in hir sauce depe” (Chaucer A127-128). Even the Prioress’s name, Madame Eglantine, is a reference to her superficiality. Eglantine is a type of rose, characterized by its sweet scent. This symbol indicates a lack of permanence, as the scent and bloom of the flower will inevitably flash-fade. Unlike spirituality, material obsession will not last and as much as the Prioress attempts to cultivate her image, her beautiful appearance and noble facade are easily stripped away. Because the Prioress is so concerned with how others perceive her, she tells a moralizing and evangelical tale in favor of Christianity that ticks off all the boxes: she opens with a prayer, narrates a story about an innocent martyr, and emphasizes the importance of the Virgin Mary. Aside from the troubling anti-Semitism, the Prioress’s section is too perfect– a performance piece meant to draw attention to her religiosity and reinforce her positive appearance. The tale functions as a mask for the Prioress to hide behind, and she presents the most idyllic version of herself to the other pilgrimage members. Much like the heavily-filtered, highlight reel of our social media lives, the Prioress uses her tale to present herself as she wants to be seen. Like social media users of the modern day, the Prioress is obsessed with appearances, and only wants others to see the best version of her possible. However, it is also unfair to say that the Prioress’s religiosity is completely fictionalized, as her reliance on religious imagery is too extreme to be feigned. The tale follows a young boy who goes forth singing O Alma redemptoris in praise of the Virgin Mary. This song is pure and innocent in comparison to the Jewish ghettos full of the “cursed folk of Herod” (Chaucer G 574). The Jews feel that their religion is being threatened by Christian influences as indicated by their reaction to the boy’s song when some of them conspire to murder him. Yet, evil does not prevail, and ultimately, the Jews are powerless against Christianity. The boy continues to sing the Gregorian chant despite having his throat slit. Not only does this part of the tale possess an evangelical and moralizing message, it also legitimizes the Prioress’s religiousity. She is clearly knowledgeable of religious works, especially Marian liturgical traditions, but furthermore, her tale follows the traditional arc of a literary representation of a saint’s life, a vita. Her knowledge of Christianity is also evident in her use of symbolism. The boy’s miraculous singing is possible because Mary slips a piece of grain under his tongue, akin to the Eucharist or Bread of Life, which would grant him eternal life. This sanctification and overt moralizing message are typical of what the Prioress should believe. The pilgrims expect her utmost concern to be evangelization and wholehearted commitment to Christianity. Yet, while the Prioress demonstrates her knowledge about Christ, it seems that her tale is too fitting to her role in society, orchestrated to further a stereotypical religiosity. With the more authentic depiction of the Prioress in the General Prologue, it becomes apparent that the tale only figures a fragment of herself. Similarly, social media offers only a marginal representation of ourselves. Our posts on Instagram only advertise the best and most beautiful portions of our lives; our weaknesses are omitted. The Prioress mirrors this desire to maintain a certain image. Her tale is saturated with holy imagery because this is the filter she wants to use to present herself. Unlike the purity exhibited by the martyr of her tale, the Prioress is consumed by a need for validation in her self-image. She is highly conscious of her appearance, which leads her to act in extremes. 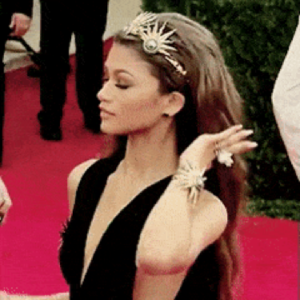 Everything she does is a performance. This puts tension between her love for grandiosity and her desire for piety. Much like this media-inclined world, only the extremes are capable of capturing attention, and the ordinary is dismissed. As the Prioress strives to highlight her virtues and mask her flaws, she represents herself in a way that is reminiscent of contemporary social media culture. Boenig, Robert, and Andrew Taylor. “Geoffrey Chaucer: The Canterbury Tales.” (2008). MS EL 26 C 9) / By Geoffrey Chaucer ; Edited By Daniel Woodward and Martin Stevens. Huntington Library Press, 1995. In many of Chaucer’s Canterbury Tales,there exist the specters of fourteenth-century social attitudes, whether these be about religion, gender, or any other topic now carefully studied by literary critics. Even amongst all of these numerous tales, however, the “Prioress’ Tale” and its blatant, vicious anti-Semitism stands out as particularly troubling. Troubling, and, unfortunately, as relevant now as it was so many centuries ago due to a curious movement among the modern alt-right supporters of America. Social and political movements, including violent or radical movements, often justify themselves with appeals to authority, wherein they use literature of the classic Western canon, from the Bible to Aristotle to Dickens, to validate their ideologies. The modern alt-right movement that has recently gained some infamy in the United States in the wake of the 2016 presidential election and the Charlottesville rally is no different. In order to gain real traction, radical movements must appear to be steeped in legitimacy. This can come in many forms, such as the pseudoscience, phrenology, perpetuating racist attitudes, but often it comes in the form of (mis)interpreting the literary canon to fit a radical ideology. For the alt-right and very far-right, a favorite author to discuss is, strangely, Jane Austen. If read and analyzed in the way that most people would, Austen is not an ardent supporter of the alt-right, but they use her works in multiple ways. For one, she becomes a symbol of sexual purity, as part of a mythological age that ended with the 1950’s in which women were pure and chaste. Austen’s novels, as do many of the titles alt-right movements use, also hearken to a nostalgic ‘better world’ of the past, where white, Christian males had the most social power. For example, in a speech at the University of Colorado Boulder, controversial conservative firebrand Milo Yiannopoulos references Austen in his speech extolling the dangers of feminism: https://www.youtube.com/watch?v=UTBafIj-ay0 (link removed to reduce the traffic to his site; please use only if needed for research purposes to avoid supporting intolerance). Austen is just one of many authors that the alt-right has picked up as validation; they are, for example, also very fond of ancient Greek Stoicism, using this philosophy to justify their beliefs. Chaucer’s “Prioress’ Tale” is a good example of the kind of literature that alt-right groups could use to justify their positions on anti-Semitism. It is a story that totally villainizes the Jewish people, putting them in bed with Satan, saying, “Oure firste foo, the serpent Sathanas/ That hath in Jues herte his waspes nest/ Up swal and seide, “O Hebrayk peple, allas!” (VII. 558-560). It not only casts Jews as villains, but also perpetuates stereotypes that have followed them for centuries, as the Prioress’s statement that the Jewish community is, “Sustened by a lord of that contree/ For foul usure and lucre of vileynye/ Hateful to Christ and to his compaignye” (VII. 490-492). In other words, they are villainous money-lenders. In addition, they hate Christians for their love of Mary, and conspire (a stereotypical favorite pastime for Jews) to murder a Christian child: “Fro thennes forth the Jues han conspired/ This innocent out of this world to chace/ An homycide therto han they hyred” (VII. 565-568). Because of its similarity to the problems that the modern alt-right movement has with the Jewish people, this tale could be made into an easy example of how Jews have been the way that they are for centuries, and are unlikely to change. It could easily be used to fuel hatred. The use of canonical literature to inspire hatred, of course, raises many problematic questions. What is the correct way to approach literature that deals with sensitive issues in insensitive ways? Is it best to attempt to teach it, giving the caveat that it is insensitive? Or is it best to ignore it, or ban it, because of the idea that even with the caveat there will be, here and there, people who use such literature to justify hatred? Is literary merit always worth that risk? This hearkens to the perennial debate about whether Huckleberry Finn should be banned; some people have moved to ban it for ‘inciting racial hatred’ in high schools. All this, of course, despite the fact that many critics do not think that Huck Finn is a racist book, and its author almost certainly wasn’t- just the possibility that it could incite hatred, due to ignorance and misinterpretation, is enough for some to want it banned. Perhaps some of the Canterbury Tales, such as the “Prioress’ Tale,” are even worse than Huck Finn, because of authorial intent. Mark Twain seems to not have been a racist; Chaucer, on the other hand, might have been terribly misogynistic or anti-Semitic. Should authorial intent matter? Indeed, should a book with literary merit be banned or restricted because its author had radical or violent views, or should it be read to try to understand and counter those views, despite the risks? Upon reading the “Prioress’ Tale” and seeing the anti-Semitism therein, these questions must be asked. For ideals that most consider dangerous and grotesque, like neo-Nazism, radical Islam, or misogyny, classic literature can be a powerful tool for trapping the mind, just as it can be a powerful tool for liberating the minds of others. The question is, which use is going to take precedence; in other words, how can the liberating be maximized while the trapping is minimized?